Like many of you, I vowed not to inflict any holiday knitting upon myself. And yet here we are, with a new scarf on the needles. For someone else. For Christmas. It all started a couple weeks ago when talking with Kelly. She mentioned that my mom said she loved her Feather and Fan scarf that I gave her last year, but she would like something warmer. 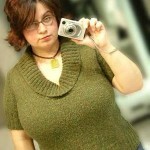 How’s a knitter to say no to that? Add in a little Catholic guilt and we’re good to go. The yarn is really nice. It’s a bit inelastic but the softness is wonderful. I’ve only made one mod so far. Instead of doing a two-stitch purl edge on each side, I’ve opted to do an i-cord edging. Here’s a closeup of the WS. I may need to buy more yarn. I bought 5 hanks and I’m almost done with one but it’s only 10 inches long. Warm and cuddly usually mean 2 wraps around the neck and plenty left over to cover the opening of the coat. So I think I may be going back to buy 1 or 2 more hanks. A 6 or 7 hank scarf, plus 2 other gifts I’ll show you soon. Are you all laughing at me yet? Wow, that’s really beautiful. The color of the yarn is great for that stitch pattern. It just looks….. perfect! I caved on the holiday knitting too. Maybe we need to make some kind of group pact for next year… Though that’s going to be a beautiful scarf. I told myself no gift knitting too, but somehow.. I already have a few projects.. damn. No, you’re not alone, this year is the first that I am knitting for the family. four women, 4 shawls, on big needles, and oh by the way, it is with yarn that is a B**ch to knit with. I keep asking my hubby, do you think they will like it? I am certifiably nut to do this, plus I need a hat for the cold weather. Jody guess what…I’m making my 3rd scarf from that pattern right now! The first two I made from Rowan Cashsoft DK, and the current one is off-white Misti Alpaca worsted…wow, great minds think alike! I prefer to do only 9 repeats per half (plus the 12 rows like the pattern says), and the scarf ends up being 52″ after blocking. I used about 400 yds per scarf. Hope that helps! Isn’t this a pretty pattern? I have this scarf myself. I love the icord edging. I’m about to start two scarves – xmas gifts ;0) – and will try it out. Can I ask where you learnt the technique? You walked right into that one didn’t you? But it is for Mom so that’s ok, they need a bit of pampering…just don’t anyone tell mine that she needs something warmer ok? I’m not laughing at you, I’m laughing with you. We’re all weak. I like that scarf! 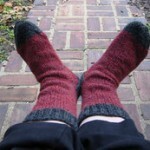 I’ve been doing so much gift knitting right now that I’m starting to get jealous – I want something for me, me, me! I NEVER knit Christmas gifts and this year I’m doing two scarves for office friends…which breaks another of my rules, to not knit a scarf! It happens to us all but as long as there is no undue pressure we’ll be fine, right!? I can just feel that angora right now. What a lovely gift; your mom’s going to love it. I’m impressed with the i-cord edging, too. It looks so much more finished that way. It’s a lovely scarf, no wonder you want to knit it for your friend. I haven’t succumbed to the holiday knitting urge, yet, and hope to remain strong. She’ll love the scarf…it’s so pretty once it’s all done. I love mine! Hopefully you’ll be able to part with yours, I had to keep the one I made. Oh, it’s gorgeous! Angora will most definitely be warm! That is going to be one appreciated gift, whether you meant to give it or not! I was laughing, until I saw the close up of the scarf! Lovely work! Don’t be so harsh on yourself. Don’t we all want to please our moms? That looks so soft and luscious. Should turn out wonderfully. I just made the Interlocking Balloons Scarf with Cherry Red Angora by Lavold. It is so fabulous to wear! And extremely warm. Mine is 9 1/2 inches wide, 74 inches long, and it took 8 balls. I love, love, love it, but when I wrap it like you describe, there is a heck of a lot of bulk around my neck. FYI. Your version of the scarf is beautiful, I plan to make one for my sister who is now studying in Ireland but have not found any yarn in a colour she would like. I didn’t promise any holiday knits this year too but it’s easier for me since I live in the tropics and no one here actually expects knitted gifts. Your scarf is lovely. 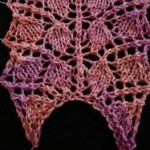 You inspire me to give the pattern a try but where do I find the information for the I cord edging? It just makes your scarf look so special.